WASHINGTON – Small business owners looking for ways to grow and develop their businesses are invited to take part in National Small Business Week’s free networking and educational forums and dialogue with leading business experts during National Small Business Week, May 20-22 in Washington, D.C. The U.S. Small Business Administration and its private sector partners are holding key business forums, and are encouraging small business owners and entrepreneurs to sign up, register and spread the word to other small businesses interested in attending. The free forums include a town hall with SBA Administrator Karen Mills on why small businesses are good for the long-term health of any economy; a social media forum on best practices for putting new media tools to work for small businesses; and an exporting forum on how SBA can help businesses find customers abroad. The schedule also includes sessions on federal contracting, selling to large companies, and business matchmaking with major corporations and government agencies. The town hall and forum events will be webcast live to allow business owners across the country to participate if they cannot attend in person. While registration is required to attend forums and sessions in person (onsite registration will be provided), the live online webcast will be available free at http://NationalSmallBusinessWeek.com. To register to attend, find more information on the live webcast, or for a detailed schedule of events and speakers, visit the National Small Business Week website at www.NationalSmallBusinessWeek.com. Congress has set goals to help woman-owned small businesses (WOSBs) gain their share of the federal contracting market. However, without a specific set-aside contract program for WOSBs, such as those in place for small disadvantaged businesses (e.g., the 8(a) program), service-disabled veterans and historically underutilized business zones (HUBZone), WOSBs only received 4% of the $400+ billion contracts awarded annually well shy of the 5% statutory goal. While the WOSB Program was formally launched by the SBA in February 2011, it wasn’t until April 2011 that the federal procurement officials were able to set-aside contracts under the program. So what is the WOSB Program and how can you take advantage of it? Here’s what you need to know and the steps you need to take to get your business certified to participate! What is the WOSB Program? The WOSB Program is a win-win for WOSBs and EDWOSBs (Economically Disadvantaged Women-Owned Small Businesses) and the federal government. WOSBs now have an opportunity to compete for and win contracts specifically set aside for WOSBs. There is reasonable expectation that two or more WOSBs/EDWOSBs will submit offers. The anticipated award price of the contract does not exceed $6.5 million in the case of manufacturing contracts and $4 million in the case of all other contracts. Are you Eligible for WOSB/EDWOSB Set-Asides? Are you a small business as defined by SBA standards for your industry? – Read “Am I a small business concern?” from the SBA to determine if you are. If you are not eligible you can still consider teaming with a small business prime contractor who is. Are you a woman-owned small business (WOSB)? – Your business must beat least 51% directly or unconditionally owned by one or more women. In addition, the management and daily business operations must be controlled by one or more women who are U.S. citizens. Does your business function within one of the over 300 industries (known as NAICS codes) for the WOSB program? If you meet the eligibility requirements above, you’ll then need to either self-certify or obtain third party certification (read more about the certification process here). To ensure you can compete for these WOSB set-aside contracts as soon as possible, take the time to review all the program requirements on the SBA website and ensure your required documents are uploaded to the WOSB Program Repository. WOSBs also will need to update their status in the Central Contractor Registration (CCR) and the Online Representation and Certification Application (ORCA) to indicate to contracting officers that they are eligible to participate. The SBA is engaging in a number of training and outreach activities to help small business owners understand the program – contact your local SBA Office for more information. The agency has also put together this easy-to-read handbook (PDF) for small businesses interested in learning about the WOSB Program, including eligibility requirements, federal contracting opportunities, and how the program works in general. Government Contracting Guide – Includes information on getting started, what is needed to work with the government, and how to identify, create and pursue potential business opportunities. Online Training Courses – These free self-paced courses are designed to help small businesses learn more about the federal contracting market. Local SBA Offices – Talk to a liaison at your local office about the federal contracting process. SBA Community – Government Contracting Discussion Board – Got questions about contracting? Post them here or scroll through existing threads for answers. Smart phone users interested in starting or growing a small business can now find helpful resources at their fingertips via a new SBA mobile application from the U.S. Small Business Administration. Developed and donated as a gift by Palo Alto Software, Inc., the SBA mobile app will make the search for extensive resources more efficient, whether users are starting a new business or taking an existing business to a new level. The app will first be available for the Apple iPhone®, with future versions for other smart phone platforms. Where can I go in my area to get free help with writing a business plan? And where do I begin finding funding for my business? The SBA mobile app also features a built-in startup cost calculator to help estimate the costs associated with getting a business off the ground, plus an SBA partner locator to help users find SBA offices, Small Business and Technology Development Centers, Women’s Business Centers and SCORE. Users will also have mobile access to SBA video content and social media alerts to provide them with tips on the go. This will include live updates from the SBA’s YouTube channel and from SBA’s Twitter feeds. 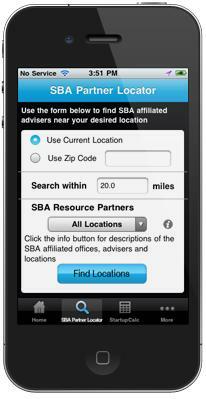 The free mobile app can be downloaded from the SBA’s website at www.sba.gov/content/sba-mobile-app . WASHINGTON, D.C. – Small businesses seeking to grow their businesses and create jobs through exporting can turn to new, free educational videos created through a partnership between the U.S. Small Business Administration, Inc. Magazine and AT&T. Through the public-private partnership, a series of video modules has been developed to inspire and encourage American small businesses to actively pursue exporting and to educate them on how to do so. The video series, Take Your Business Global, features five main topics that guide small businesses through the process of exporting: Getting Started in Exporting; Planning for Export success; Connecting with Foreign Buyers; Financing; and five Case Studies of successful small business exporters. The videos begin with answers to the frequently asked question, Why Export? They feature SBA Deputy Administrator Marie Johns; U.S. Secretary of Commerce Gary Locke; U.S. Trade Representative, Ambassador Ron Kirk, and a variety of small business exporters. Other modules feature exporting experts discussing “how-to” take your business global. The videos are posted at www.inc.com/exporting. Funding for this project was jointly provided by Inc. Magazine and AT&T. Also, Inc. Magazine created the site to host the videos; both firms will distribute DVD copies of the videos and related materials approved by SBA and promote the series in online and print advertising. The joint program will be launched April 8, at the Cosmopolitan Hotel in Las Vegas, at the Inc. conference GROWCO, an event targeting growing small businesses. The co-sponsorship agreements will remain in effect through August 31, 2012. Cosponsorship Authorization # 10-7080-165. SBA’s participation in this cosponsored activity is not an endorsement of the views, opinions, products or services of any cosponsor or other person or entity. All SBA programs and services are extended to the public on a nondiscriminatory basis. WASHINGTON – Beginning March 1, states can apply for grants from the U.S. Small Business Administration to support efforts to increase exporting by small businesses. The State Trade and Export Promotion (STEP) pilot grant initiative is authorized to provide up to $90 million in grants to states over the next three years. The STEP pilot grant initiative is aimed at achieving two goals: 1) increase the number of small businesses that want to export and 2) increase the value of exports for those small businesses that currently export. Established by the Small Business Jobs Act of 2010, the 50 states, the District of Columbia and U.S. territories are all eligible to apply for grants, which will be awarded on a competitive basis. The Jobs Act authorized up to $90 million over three fiscal years, $30 million each year, beginning with the current fiscal year 2011. Individual state project award amounts will vary based on each state’s proposed project plan and budget. A state may not submit more than one application for a grant under the initiative, but may apply each federal fiscal year through the 3-year term of the pilot grant initiative. Activities that can be supported with grant dollars under this initiative may include: participation in foreign trade missions, foreign market sales trips, subscription services provided by USDOC, design of international marketing products or campaigns, export trade show exhibits, training workshops or other export initiatives that are in line with the goals of the pilot grant initiative. The STEP pilot grant initiative announcement will be posted at www.Grants.gov on March 1, 2011. The application period will be March 1 through April 26. Awards for the first year of the grant program will be issued in summer of 2011. See more information at www.sba.gov/STEP. WASHINGTON, D.C. – Small businesses facing maturity of commercial mortgages or balloon payments before Dec. 31, 2012, may be able to refinance their mortgage debt with a 504 loan from the U.S. Small Business Administration under a new, temporary program announced today.